Martha Rosenstein was born and raised in Alaska. She tried to escape Alaska by going to Seattle to attend the University of Washington where she got an undergraduate degree in anthropology, but returned to Alaska to attend nursing school at the University of Alaska Anchorage. After a medical mission trip to Burkina Faso, West Africa, she decided to go on to get her master’s in nursing from the University of Cincinnati. Martha currently practices as a Family Nurse Practitioner at Luminary Integrated Health as well as running her own website and hosting her own podcast both of which are focused on holistic health for active people. Martha grew up cross-country skiing (in a backpack on her mom’s back before she could walk) and was recruited for the cross-country running team in Jr. High School because she was the only person in her gym class who ran a whole mile without stopping. Running has always been her favorite sport, but in 2016 she discovered triathlons. 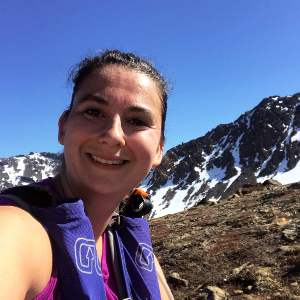 In 2017 she was peer pressured into her first 50K, and she is now looking forward to doing another. She also enjoys hiking and alpine skiing. When she’s not playing outside you can find her cooking, reading research articles for fun, or traveling to far off places.